Description: Right across from the Station Inn is this eastbound mixed freight heading upgrade before the rain. Title: NS Eastbound 18G @ 0843 hrs. Description: NS 162 with a trio of EMD`s from the SD70 family. Title: WB 11J, October 08, 2006 @ 0918 hrs. Description: WB Autorack, 0847 hours. 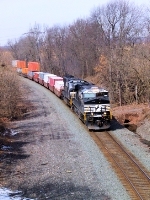 Description: Westbound NS 13G races through Cove on a beautiful Friday afternoon. Description: NS 21R heads towards Memphis, but before that, they'll stop at the John Whitaker intermodal center just a few miles away. Description: The NS 2589 leads a northbound freight on the NS Marion Branch at Highway 9. Description: 2589 parked in the yard. 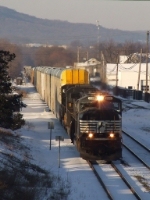 Description: One of ten SD70M's from NS' first order brings the 212 past milepost 30 at 7:59AM. Description: NS 2589 is the leader as it approaches the Lower Lansdowne Grade Crossing. Description: NS2589 with a 308 axel NS212 rounds the curve on Track 1 at Park Avenue in South Plainfield NJ. Description: Higginsville Road, Readington Township, 1222 hours.